BooKoo Energy is a small anti-corporate start-up committed to getting the most out of life and providing the high-intensity fuel which that attitude requires. 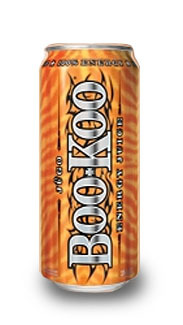 BooKoo comes in a wide variety of flavors and formulations, including BooKoo water, BooKoo shots, and BooKoo Energy in 16 and 24 fl oz sizes. The BooKoo website offers up plenty of 'tude and action, with a plethora of contests (Pimp your sled, movie contest, photo contest, promote-your-band contest, "Wild BooKoo Girl" modeling contest). BooKoo sponsors the BooKoo Arenacross Championship Series (a specialized form of indoor motocross) and has signed and sponsored a number of riders and boarders, such as Australian FMX star Dayne Kinnaird, and surfer/skimboarder Drew Meseck.